Pentax has announced two new digital camera models in its Optio range, the Pentax Optio T30 and the Pentax Optio M30. Chief among the Pentax Optio T30's features is face recognition technology that locks onto faces in photos to reduce focus errors. It also features a 3x optical zoom lens, a 7.1 megapixel CCD image sensor and a 3-inch touchscreen LCD. Other goodies include high ISO digital shake reduction, a touch-control system and on-screen image manipulation. 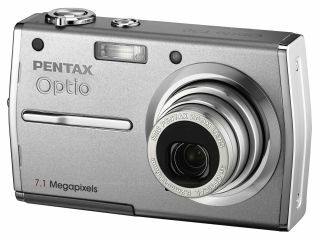 The Pentax Optio M30 is an ultra-slim, entry-level 7.1-megapixel camera with a 3x optical zoom lens. It also features face recognition auto focus and shake reduction, along with an auto picture mode for the best settings regardless of the conditions. It has a maximum ISO of 3200 for low light situations. The Optio T30 and Optio M30 are due for launch in February, priced at £200 and £140 respectively.